Welcome back. Not long after the pyramids were constructed, I obtained a 5-year Bachelor of Civil Engineering. Although I got through an ungodly number of courses to rack up 180 credit hours, I never had a course in materials science. That I missed or didn’t appreciate advances in wood science and technology over the years is a testament to that gap in my education. But even I’m amazed at what a team of researchers from Maryland, California Merced and Northeastern universities and the USDA Forest Service developed: A way to transform wood into a product that’s about as strong as steel. Wood has a lot going for it as a structural material. It’s abundant, renewable and inexpensive, and it boasts a history of use dating back to the Stone Age. On the other hand, wood isn’t going to win prizes for strength, at least when compared to synthetic materials like steel. That said, the drawbacks of steel or alloys include weight and environmental impact, while composites require complex, costly manufacturing processes. So, for wood to win in all categories, all you’ve got to do is make it stronger without affecting its other properties or impacting the environment. 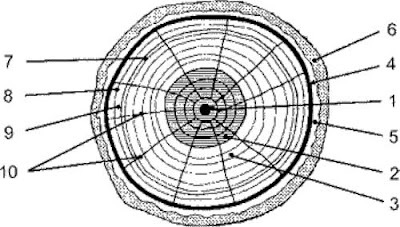 Tree cross section: 1-pith, 2-heartwood, 3-sapwood, 4-cambiumm layer, 5-bast fibre, 6-bark, 7-annual rings, 8-spring growth, 9-autumn growth, 10-medullary rays (from www.boeingconsult.com/tafe/mat/Timber/HowTreeGrows-OH.htm). Wood, like all plants, is composed of cells. Look at a newly cut tree stump. The lighter colored sapwood near the outer edge has tubular xylem that transport water and nutrients from roots to leaves. The sapwood encircles the darker, dead heartwood, in which the xylem have filled with resin or gums. Although xylem contain other cell types, the most distinctive are the long tracheids, primarily in softwood species, and the somewhat more visible vessel elements that are predominant in hardwood species. Softwood (L) and hardwood tree cell structure, magnified 50 times (from www.boeingconsult.com/tafe/mat/Timber/HowTreeGrows-OH.htm). 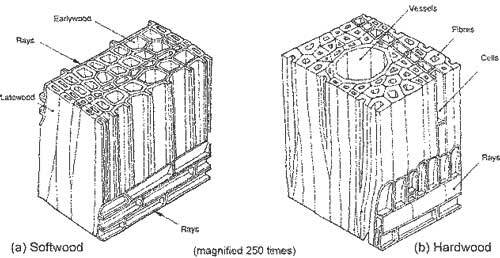 Wood cells consist of cellulose (about 50%), lignin (about 20% to 25% in hardwoods, 25% to 33% in softwoods) and hemicellulose (the residual). In general, cellulose is wood’s fibrous bulk. Lignin holds the fibers together, filling the cell wall spaces between cellulose and hemicellulose and conferring mechanical strength as well as a more hydrophobic barrier for water transport. Softwood (L) and hardwood tree cell structure, magnified 250 times (from www.boeingconsult.com/tafe/mat/Timber/HowTreeGrows-OH.htm). Over the years, different studies have had limited success devising processes to increase wood density and strength. Pretreatment with steam, heat, ammonia or cold rolling followed by densification has improved mechanical performance but resulted in incomplete densification and a lack of dimensional stability. For their breakthrough solution, the researchers developed a two-step process: (1) boil the wood in an aqueous mixture of sodium hydroxide and sodium sulfite to remove just the right amount of lignin and hemicellulose, then (2) compress the wood between metal plates heated to 100°Celsius at a pressure of 725 pounds/square inch (5 megapascals) to remove most of the xylem tubes (vessel elements and tracheids). The resulting processed wood is about 80% thinner and has triple the density; more than a tenfold increase in strength, toughness and ballistic resistance; and greater dimensional stability. The final product is about as strong as steel though six times lighter weight. Its specific strength (strength/density) is higher than that of most structural metals and alloys. 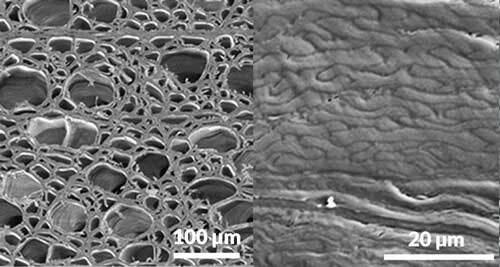 Scanning electron microscopy images of wood before (L) and after processing to increase density and strength (from www.nature.com/articles/nature25476). With its higher density, the processed wood will not float on water but neither does it swell much on contact with water. Overall, the resulting materials and their laminates are relatively easy to produce. The process is applicable with various tree species and, with reasonable care, the chemicals pose no significant environmental concern. As I wrote, even I can see that wood has come a long way. Thanks for stopping by.